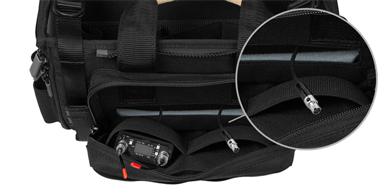 The PortaBrace AO-302S Audio Organizer “SILENT” Pro Audio Bag for Field Recorders (Black) is designed for use with audio field mixers and quiet connectors. Lightweight yet rugged construction—the kind professionals have come to expect from us up here in Vermont—are also key features of the Audio Organizer. The bag keeps things quiet while recording thanks to its nearly noiseless magnetic connectors. It also features rubber-tipped zippers, which prevent the sound of metal on metal. Other thoughtful touches include fully detachable side panels for easy access to mixer inputs and outputs, and MOLLE strips for conveniently holding receivers, cables, headphones, and the like. You will also find hop pouches on either side, along with a zippable flask holder. Additionally, the Piggin’ String lends a hand with longer coils of cable and extension cords. A light but strong aluminum frame ensures a sturdy case that won’t weigh you down. In fact, this Audio Organizer, at 2.7lb, weighs almost half that of competitor’s cases. The exterior is made from durable waterproofed 1000-Denier Cordura, protecting it from the elements, and the roughest environments. The interior keeps your gear safe with its soft and protective material. Two padded dividers provide extra security. One pad also has a removable elastic wireless holder that can accommodate up to 3 wireless units. When it comes to transporting the bag, durable nylon handles with suede ensure a reliable grip. The case can also be carried using the comfortable HB-10M adjustable suede shoulder strap. “D” rings allow for attachment to a harness. You can be certain that just like all other PortaBrace cases, this one was made at our factory in Vermont and will last for many years to come. The Audio Organizer SILENT Pro Audio Bag is one tough case. This audio case features a lightweight, yet strong aluminum frame that’s almost half the weight of competitor’s cases. The exterior is made of durable waterproofed 1000-Denier Cordura. Rain, snow—whatever nasty weather you find yourself working in—the Audio Organizer will remain reliable for years to come. The interior is just as soft as the exterior is rugged, ensuring the protection of your audio gear. The included 2 padded interior dividers provide extra security, along with more options for holding your equipment. One pad also has a removable elastic wireless holder that can hold up to 3 wireless units. As its name suggests, the Audio Organizer SILENT series case is made to be quiet while recording, and is intended for use with audio field mixers and recorders with quiet connectors. The bag achieves this with quiet magnetic connectors. It also features rubber-tipped zippers that prevent the sound of metal on metal when recording. This case is a large self-contained unit, designed specifically for audio recorders and mixers with quiet connectors. Thanks to plenty of storage options there is also ample room for multiple receivers. A large front pocket can hold any extra equipment, while the MOLLE—nylon strips sewn horizontally across the bag--attached to the pocket allow the user to clip or hang receivers, cables, headphones, and so on, to the bag. Both sides of the AO-SILENT feature fully detachable side panels for easy access to mixer inputs and outputs. You will also find transmitter hop pouches on either side, along with one zippable flask holder. The included Piggin’ String lends a hand with longer coils of large cables and extension cords. The Audio Organizer SILENT Series Case is made with durable nylon handles that have a suede grip for carrying. The HB-10M adjustable suede shoulder strap is comfortable, even for long wear, and removable. Sound engineers with their own harness can attach the case to it with the “D” rings. Made in the USA in Vermont, the name PortaBrace signifies the ultimate in professional storage and transport for your gear. The hardworking men and women at our company ensure that every piece they make is crafted with integrity and pride with the professional’s needs in mind, and that each piece will last for years to come.